Refuge alternatives are airtight, reinforced shelters that underground coal miners can enter during a mine emergency. Although refuge alternatives are considered a last resort in an emergency, it is imperative that miners know how to operate these devices in the event of an emergency. This publication provides recommendations for training miners in how to operate a refuge chamber. It is organized into three sections. The first section details four refuge chamber training sessions that were observed by NIOSH researchers in order to determine the topics mine trainers were covering in their first efforts at refuge chamber training. 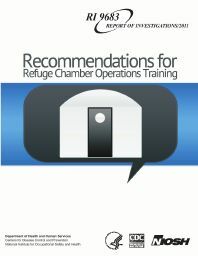 The second section presents a guide for trainers which details the most important content to include in refuge chamber training and provides tips on teaching techniques and activities that may increase the effectiveness of the training. The third section presents a condensed version of the most important training content, specifically formatted for miners. Miners can refer to the list in the third section of this document to make sure they understand the basics of refuge chamber operation.